Thanksgiving should be a daily occurrence...not the turkey dinner but the reminder to give thanks every day and be grateful. We are grateful for so many people in our lives. Our family, our friends, (many of whom we consider family) and those we are connected to and have met only because of Cam. In some way, as you are reading this, know that you have enriched our lives and we are simply thankful. We did celebrate the holiday with the traditional offering of a stuffed bird dinner with all of the fixings. Jane ordered up a 23 pound turkey for 7 people which possibly, just maybe was beyond what was needed. Regardless, Opa and Cam worked to make the stuffing, stuff the turkey and prepare it for cooking. Cam took his supervisory duties quite seriously. Healthy gift from Oma & Opa! We were so happy Aunt Mary and Uncle Ray joined us to partake in this celebration. As we all went around the table and said what we were thankful for, everyone was filled with emotion and gratitude. Do we still look stuffed? Cam's thankful speech..."I am thankful for my family and my friends, especially my parents. Amen." If he hadn't been so hungry, we're quite certain his speech would have been longer. In all of the activity, we neglected to get a group picture to capture the moment but we won't soon forget the delicious meal, great company, and fun conversation. With our tree all decorated, we decided to try a family photo the day after Thanksgiving to test out the technology on Jane's watch to remotely control her phone for taking pictures. The first snapshot clearly shows some of us looking at the watch for the countdown. To work off some of our delicious food, Cam enjoyed a swim at the Y with his parents and was excited to see a local trooper parked outside upon departure. He wondered what the officer was doing there and noted that since he was in uniform, he probably wasn't there to work out. 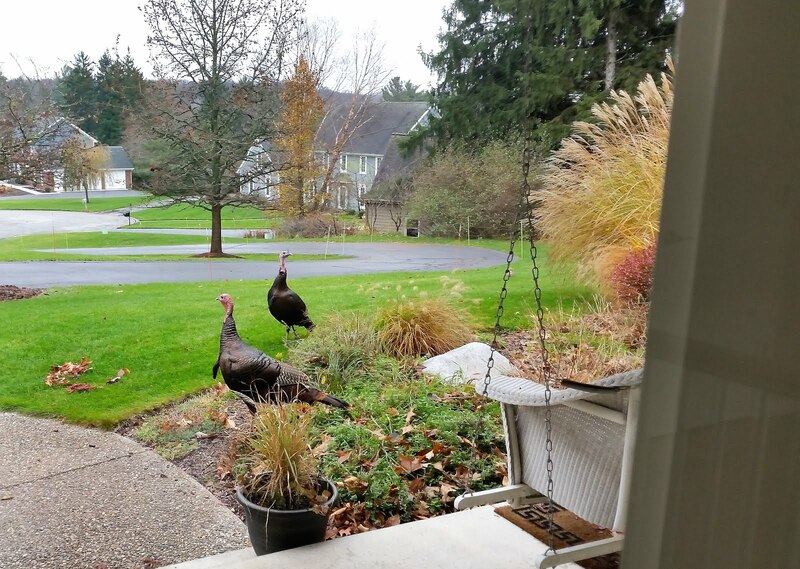 Also over the weekend, we had a quite a chuckle, or is it a gobble, over the fact that turkeys seemed to be surrounding our house. These two in the front yard actually jumped up on the porch and looked in our windows. Possibly they were feeling a bit brave with the holiday in the past. Amanda asked Cam before Thanksgiving what he was thankful for. "I am thankful for you, Miss Amanda."